A Note On Scene: How Do Our Surroundings Convey Emotion? As writers, our job is to step out of the ordinary. To wrestle against our first choices in character, in dialogue, in setting, in scene. I remember the first time someone told me NOT to end a scene with a character pausing at a doorway to look back once more. Of course, I had written that! And it took a lot for me to rewrite that moment. In my mind, it was a powerful pause. And the doorway had so much unspoken meaning (to me; not to the millions who have over-read the same scenario!) Doorway good-bye's are cliché <ouch>. The setting within our scenes can be very powerful in transmitting certain feelings, yes. But don’t get locked into cliché- Gray clouds to convey sadness. Bright sunshine for anything happy. Our scenes can often take on the expected and become a cliché in their own right as much as our words: “It’s raining cats and dogs." Where is your main character when he is down-and-out? A lonely diner with tracks of raindrops on the window pane? What about when he is reflective? Do we find him on a cliff's edge at sunset? Remember, it’s not so much where the character is and what surrounds him, as much as what he notices. Our emotions dictate what we see. What stands out. How we focus. Gloom is not pinned to a rainy day as much as joy is not to a bright one. But when our character feels depressed or burdened, he might be prone to find the negative in the blessing. He might conjure memories from benign objects we as readers wouldn't have even noticed. The weathering on the shingles. The last toy in the sandbox. The empty rope swing. All can create a tempered mood despite the weather. And can tell us more about our character than merely what he sees or where he is. So, don’t become locked into the rain to evoke sadness or the sun to bring forth laughter. In fact, authentic emotions are better displayed on the backdrop of contrast. 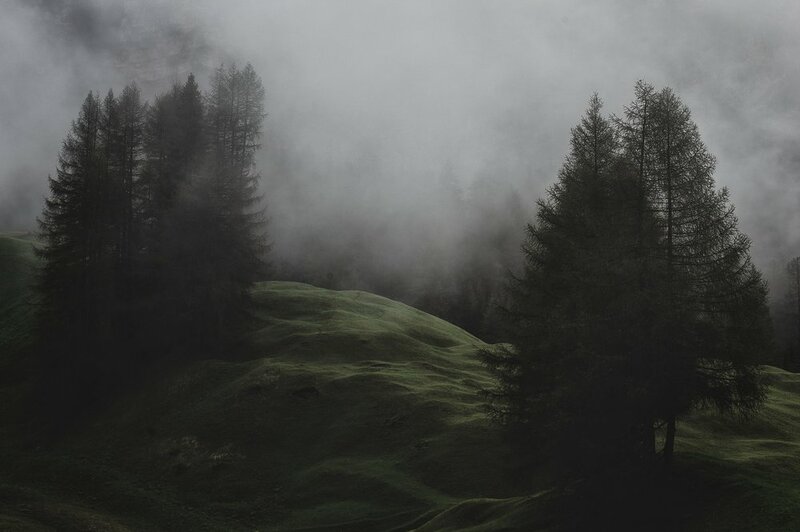 A fear-invoking environment (i.e., creepy woods on a moonless night) that ignites a sense of tranquility and comfort in our protagonist will raise eyebrows quicker and give our readers something to chew on outside of the expected. If your idea travels down the first rut it encounters in your brain, remember, the rut is there for a reason ... the path has been traveled again and again. Warning sign for cliché!